I read Steve Harvey's Act Like a Lady, Think Like a Man when it first released in early 2009. Back then, the book made a huge ruckus among the black community. Black men thought Steve Harvey were giving away secrets and being a traitor. Black women felt he was genuinely trying to help single sisters out in the dating game by revealing how men think and what men really want. The hoopla will probably rise again as more people watch the movie. I saw Think Like a Man during opening weekend with two friends. The theater was crowded. Lots of people showed up to support Steve Harvey's book-turned-to-movie. I had high hopes because of the all-star cast and content. Actors included Michael Ealy, Meagan Good, Regina Hall, Kevin Hart, Taraji P. Henson, Gary Owen, Jenifer Lewis, Terrance J, Gabrielle Union, Jerry Ferrara and Romany Malco. So what did I think of the movie adaptation? Well, it chose good aspects of the book to play out on the big screen. The 90-day Rule, Successful Independent Woman and Single Mother were among the story lines. At times, the movie seemed like an extra long infomercial for the 3-year-old dating guide. The actors would play out a scene, then all of a sudden Steve Harvey and his teeth pop out of nowhere offering commentary. So random! But most of all, I laughed at Kevin Hart's character. Casting Hart was a good choice; I wouldn't have liked the movie as much without his character of the recently-divorced man and his narration. The movie is sure to spark conversation with your significant other or friends. I had a great conversation with my two friends about certain dating practices, scenarios and "what ifs." 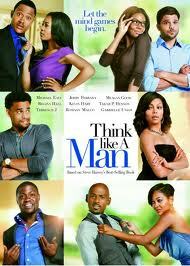 Check out the trailer below then share your thoughts on Think Like a Man.